For nearly three years the press and the penny-investor bulletin boards have been excited by the alleged finding of a potential oilfield in the Weald Basin, bigger than the North Sea in oil content, below Surrey, Sussex, Kent and Hampshire. It started with the oil flow testing results reported from Horse Hill-1 (HH-1) – the so-called Gatwick Gusher – drilled by UK Oil and Gas (UKOG) in the summer of 2014. 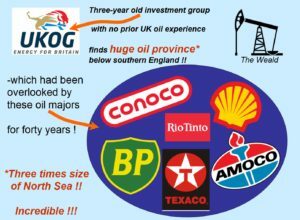 UKOG beats the oil majors at their own game! Click to enlarge. The majors drilled right through the Kimmeridgian; they tested it; they had the long-reach horizontal drilling technology (witness BP’s Wytch Farm development in Dorset and out under Bournemouth Bay – the biggest onshore oil field in Europe); so why did they all miss it? It seems to have been left to a small investment group UKOG, plus a few related minor hydrocarbon exploration companies, to unearth this bonanza. All the current petroleum exploration and development licences (PEDLs) in the Weald issued by the Oil and Gas Authority are classified as ‘conventional’. That means no fracking and no large-scale acidising (another form of ‘stimulation’). So since fracking will not be used (they say) there is no new technology available to UKOG that was not already known to BP, Shell and the other majors in the 1980s. I decided to look into the geology of the Horse Hill discovery, but didn’t realise until I started that I was opening a can of worms. The resulting technical analysis is here. This blog summarises my findings in a less technical way. Magellan Petroleum formerly had a stake in HH-1. The Magellan interpretation of the geology from 2009 was modified by UKOG after the results of HH-1 came in. But UKOG made the fundamental mistake of retaining the prior fault pattern instead of throwing it out and re-mapping the geology from scratch. The animation below illustrates the error. Animation of UKOG faulting (mauve) with corrected fault pattern (blue) taking proper account of all the seismic data and the results of Horse Hill-1. Teeth mark the downthrown side of the faults (click to start). Magellan had interpreted the geology as comprising a higher-standing block called a horst, bounded to the north and south by faults. It also said that the old BP well Collendean Farm-1 (CF-1), dating from 1964, lay off the edge of the horst block. BP had drilled in the wrong place, according to Magellan. HH-1 was planned to be drilled into the horst block. The Top Portland Sandstone was predicted to be about 100 m shallower here than at CF-1. But it turned out to be 18 m deeper. In the light of this result UKOG bodged up a re-interpretation, while retaining two Magellan faults running ESE from CF-1 (mauve toothed lines). But the more southerly of these now has an alternating sense of displacement (the downthrow), which is geologically untenable except in certain geological terrains which do not apply here. Going from west to east, the fault downthrows to the south, then to the north, then back to the south again. I re-examined the seismic data to see where the faults lie. My version is shown by the two blue toothed lines in the animation above. There is a southerly Horse Hill Fault running just north of HH-1, and dying out to the west. The crucial evidence comes from a vintage 1962 seismic line very near HH-1 which Magellan and UKOG omitted from their database. It is of poor quality, but does the job. CF-1 lies just to the south of a mauve fault, and also just south of my blue Collendean Farm Fault. There is unfaulted geological continuity from CF-1, traced on seismic data round the west end of the Horse Hill Fault, then back east to HH-1. BP did not drill on the ‘wrong’ side of the fault. The seismic continuity of the nearly flat layers west of HH-1 fits perfectly with the fact that HH-1 is deeper than CF-1 by 18 m.
So the two blue faults of my remapping are parallel and distinct; they run ENE-WSW, following the regional pattern. Despite its shambolic re-interpretation, UKOG has indeed made a minor discovery of conventional oil in the Portland Sandstone, but it will need to re-map the geological structure from scratch, to then explain to its investors whether or not it is worth exploiting commercially. What of the huge Kimmeridge ‘discovery’? 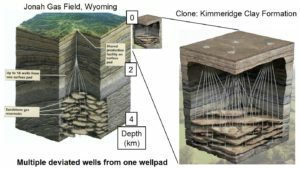 UKOG leans on calculations made for it by Schlumberger, a respectable oil service company, who estimated that in the whole Kimmeridge Clay Formation there was 176 million barrels of oil in place per square mile based on the HH-1 results. UKOG further declares that this oil will be exploitable by a curious concept of multiple deviated wells from each pad. Its picture is shown at approximately the same scale as the Jonah Gas Field, Wyoming, below left, and expanded on the right. The UKOG deviated well concept for the Weald has been copied from the Jonah Gas Field, Wyoming (click to enlarge). The giveaway in UKOG’s concept is their depiction of the Kimmeridge Clay Formation (KCF) as having a platy character, somewhat like a pile of overlapping chappaties. They appear to have borrowed the concept from the Jonah Gas Field, where tight sandstone lenses full of gas are exploited by multiple deviated wells. The deviated Jonah wells are fracked to stimulate the gas flow. But this deviated well concept is useless for the KCF. Firstly, the scale is all wrong, because the KCF is 4-5 times shallower than the Wyoming sandstones, and secondly, the lens concept is completely inappropriate, since the KCF layers, in particular the limestone (micrite) layers, run laterally for 50-100 km without significant change. The tight KCF will require fracking of horizontal wells, drilled preferentially E-W, along the micrites. I don’t know whether this deviated well concept for the KCF has been deliberately devised by UKOG to fool the public, or whether it is ignorance, pure and simple, on the part of its development geologists, but in either case it won’t work. As for the supposed huge reserve of KCF oil below the Weald; the oil in place has been estimated by Schlumberger on a per square mile basis. But how much area of a fractured fault zone can actually be drained from this single well? In addition, one certainly cannot extrapolate the fault zone flow results from HH-1 to the Weald generally. Using Schlumberger’s figure above, and a produceable reserve from the fractured tight KCF formation of 1% of the oil in place, HH-1 might be able, optimistically, to produce 177,000 barrels from the fault zone. In other words it might make enough to recover the costs of its exploration and development. This sort of figure might also be applicable along this and other fault zones. In conclusion, the Gatwick Gusher’s results are anomalous because UKOG drilled a fault zone. It is irresponsible and misleading to apply those local flow results outside that and other similar fault zones, i.e in the 95% or more of the KCF which is not affected by a fault zone. There will be no KCF bonanza in the Weald – unless the countryside is indeed industrialised to permit wholesale fracking of horizontal wells throughout the region, with a 1-3 km well pad spacing similar to, say, NE Pennsylvania. But UKOG doesn’t want us to know that.